Members of the local Salvadorian community came together with activists today to protest the actions of Canadian mining company Pacific Rim. The company wants to expand its operations into El Salvador to develop a large gold mine. 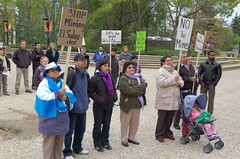 Metal mining is currently not permitted in El Salvador. Here is the full set of photos.